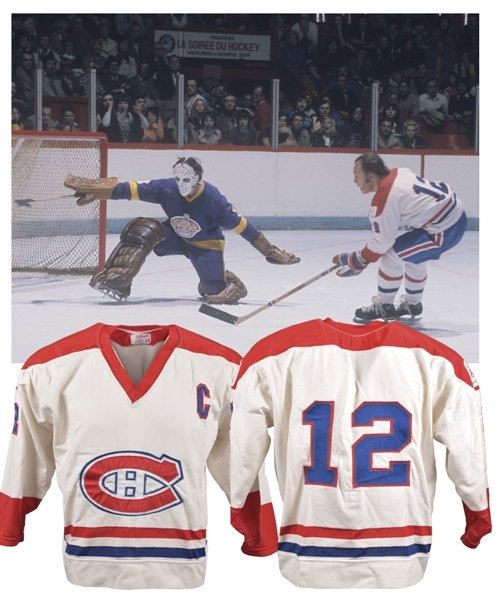 From the glorious mid-1970s when the Montreal Canadiens were on the verge of producing one of the greatest Stanley Cup dynasties the sport has ever witnessed, we have a desirable Yvan Cournoyer Canadiens pro-style captain’s jersey. A Wilson label with “44” sizing is affixed to the collar, with no other labeling present. Styled with the famous Canadiens team crest fully administered in tackle twill, the durene V-neck has “12” over the sleeves and verso in blue-over-red layered twill, with matching 1976 Olympic patches over each shoulder along with an intact garter-style fight strap. We should note that while the jersey shows use and is of pro quality, we couldn’t find any photos of Yvan wearing examples this hemmed-up (he did wear hemmed-up jerseys), and with the team crest so close to the lower striping bands. A pair of slits/holes are present over the front just beneath the right shoulder, with a few other small random marks including some red paint transfer over each sleeve.